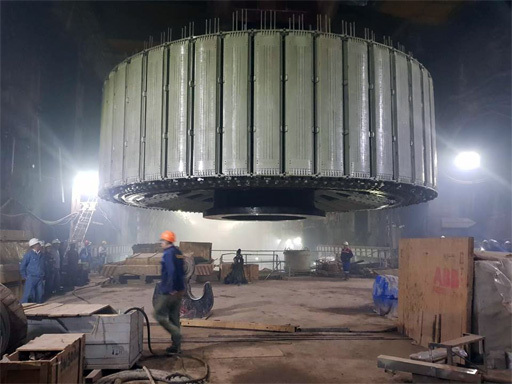 DUSHANBE (Asia-Plus) — Specialists from Ukraine’s Dnipro-SGEM and Electrotyazhmash have installed the rotor of Unit 6, the first of the six future units of the Roghun hydroelectric power plant (HPP). According to Dnipro-SGEM, the work on installing the rotor weighing 850 tons was completed on July 5. Unit 6 is expected to be operational on November 16, 2018 and Unit 5 is in 2019. Roghun HPP is an embankment dam in the preliminary stages of construction on the Vakhsh River in southern Tajikistan. It is one of the planned hydroelectric power plants of Vakhsh Cascade. In late October 2016, Tajikistan stopped the flow of the Vakhsh River for construction of the Roghun HPP. Explosives were used on October 29, 2016 to block the main riverbed of the Vakhsh River, marking the first substantial step toward building the dam. The work on the Vakhsh River has not affected existing hydroelectric facilities downstream. The Roghun HPP was first proposed in 1959 and a technical scheme was developed by 1965. Construction began in 1976 but the project was frozen after the collapse of the Soviet Union. An agreement on finishing the construction was signed between Tajikistan and Russia in 1994; however, as the agreement was not implemented, it was denounced by Tajikistan parliament. In October 2004, Tajikistan signed an agreement with Russia’s RusAl aluminum company, according to which RusAl agreed to complete the Roghun facility and rebuild the Tursunzoda aluminum smelter. In August 2007, Tajikistan formally revoked the contract with RusAl, accusing it of failing to fulfil its obligations. Subsequently, in April 2008, Tajikistan founded OJSC NBO Roghun with an authorized capital of 116 mln somoni for completing the construction of the Roghun HPP. Current authorized capital of OJSC NBO Roghun reportedly amounts to more than 12 mln somoni. To raise funds needed for the construction of the Roghun HPP, the government started to sell shares in Roghun to public on January 6, 2010 and issued 6 bln somoni worth of Roghun shares. The sale of Roghun shares has reportedly earned the government 980 mln somoni. In 2016, construction duties on Roghun were assigned to Italian company Salini Impregilo. It is estimated that the project will cost $3.9 bln to complete. The project is broken down into four components, with the most expensive one involving the building of a 335-meter-high rockfill dam — the tallest in the world — which will entail costs of around $1.95 bln. If built as planned, the dam will be the tallest in the world at 335 m and have a capacity of 3.6 GW.